Surrounded by our privately owned fields and forests, and in complete harmony with nature, these three old barns built in stone, slate and wood are environmentally friendly. The water comes from a spring and both the electricity and the hot water are generated by solar power. We had one week at Cal Sodhi, staying in one of the properties. We like accommodation that is of a good quality that is in a quiet and picturesque location. Cal Sodhi certainly lived up to our expectations. In fact, we gave it 5/5 on all accounts, apart from facilities, purely because it did not have a pool. However, the owners, Rosa and Kami, intend to have one in place for next season. Having said that, our experince was so good, we would go back whether the pool was in place or not. The family are rightly very proud of their hard work to make their village live once again and are very, very conscious of caring for and protecting this beautiful area. All the family are incredibly helpful and friendly, with a special mention for Rosa's Dad. I parked the car next to the old trough to clean my windscreen and within minutes he was out with a hosepipe ready for me to wash the whole car. There are so many things to do and see in the area, but when you can walk out of your property and sit and look at the magnificent views, you don't need to go very far! We have visited more than once it was so good, we really Cal Sodhi and have stayed in three of the houses over the last few years. It has been great seeing the owners each time and watching as their properties have developed. The location is great with wonderful views and very peaceful with lots of great walking, mountain biking and driving (4x4) routes from the door - we have explored most of them! We often stay during the ski season and travel to either nearby Andorra or Massella for half a day ski-ing, its a 40 minute journey by car but we don't want to ski every day so its fine. The owners are very friendly and helpful and have even translated by telephone for me once when we needed to communicate with a security guard while out and about as we had parked in the wrong place! It definately worth a visit if you like the peace and quite of the countryside and appreciate good quality accommodation with all self catered amenities. Un lugar magnifico para pasar unos dias relajados en familia o amigos. Un lugar donde hay mucha paz y un ambiente muy natural. Muy recomendable para pasar unos dias en un ambiente increible. El trato con los propietarios ha sido perfecto, te dejan a tu aire y estan ahi cuando los necesitas, sin duda alguna repetiriamos de nuevo. Recomendamos poner un microondas ya que es necesario hoy en dia para la preparacion de determinadas comidas o para calentar cosas rapidamente!! 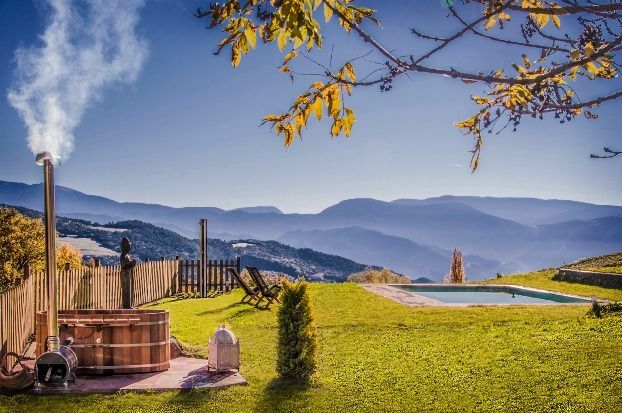 Un lugar maravilloso para desconectar de la gran ciudad,entre montañas donde respirar aire puro,unas casas con un encanto especial ademas de confortables y modernas y un trato por parte de los propietarios en especial Josep y Rosa que hacen que te sientas como en tu casa y Chut el perro de la casa es como de pelicula .La piscina en un entorno ideal y muy bien cuidada . Lo recomendamos a quienes quieran disfrutar de la naturaleza y de la trnquilidad y nosotros en cuanto tengamos oportunidad aunque vivimos muy lejos volveremos . Ja es la segona vegada que vaig a Cal Sodhi i només puc parlarne meravellas.. 100% recomanable per anar-hi amb amics, parella o familia! La ubicació es perfecte per oblidarte de tot. gracies per tot Rosa, espero poder tornar en breu. pd: també pots portar el teu gos! Casas modernas y equipadas en un entorno en un entorno natural apartado de la ciudad. A poco tiempo en coche de la Seu d'Urgell, permite realizar escapadas diarias al Parque natural y no está lejos de Andorra. El entorno de las viviendas es de ambiente familiar, muy acoedor. El personal es muy amable y te ayudarán en lo que necesites. Altamente recomendable.